Monarch Air Group provides private air charter in Charlotte, NC. Our clients benefit from top-notch service, unrelenting dedication to safety, wide selection of aircraft, and years of experience in chartering private jets. To obtain a free quote, please use our online quoting tool provided below, or call toll free 1-877-281-3051. Monarch Air Group offers private jet charter services to and from Charlotte, NC, USA. Charlotte is the largest city in the U.S. state of North Carolina. 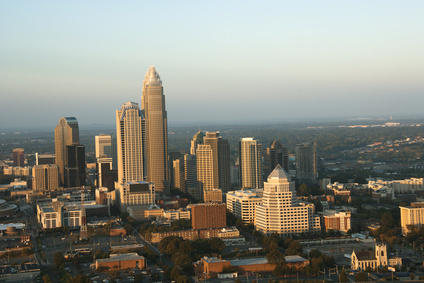 The city was named for Queen Charlotte of Mecklenburg, and it is North Carolina’s center for finance, business and technology, industry, and major entertainment. Charlotte is a city with a population of over 2,500,000 people. While being in Charlotte, make sure to visit the Lowe’s Motor Speedway to watch NASCAR racing or the SouthPark Mall (the largest in the state). There are over 30 different Fortune 500 companies. 1. CDN, Woodward Fld, Camden, United States. 2. CLT, Charlotte Douglas, Charlotte, United States. 4. HCW, Cheraw, Cheraw, United States. 5. HKY, Hickory, Hickory, United States. 6. MRN, Lenoir, Morganton, United States. 8. RKH, Rock Hill, Rock Hill, United States. 9. SPA, Spartanburg, Downtown Memorial, Spartanburg, SC, United States. 1. DoubleTree by Hilton Hotel, 895 W. Trade Street, Charlotte. 2. Hotel Sierra Charlotte Center City, 435 E Trade Street, Charlotte. 3. DoubleTree by Hilton Hotel, 895 W. Trade Street, Charlotte. 4. Ritz-Carlton, 201 East Trade Street, Charlotte. 5. Hotel Sierra Charlotte Center City, 435 E Trade Street, Charlotte. 6. Historic Dunhill Hotel in Charlotte Uptown, 237 North Tryon Street, Charlotte. 7. Hilton Charlotte Center City, 222 East 3rd Street, Charlotte. 8. Holiday Inn Charlotte-Center City, 230 North College Street, Charlotte. 9. DoubleTree by Hilton Hotel, 895 W. Trade Street, Charlotte. 10. Hilton Charlotte Center City, 222 East 3rd Street, Charlotte.